Algerian Foreign Minister, Ramtane Lamamra, stood out lately as a defender of human rights in Morocco, while he forgot to put in order his own house, Algeria, where riot policemen are often ten times more numerous than peaceful demonstrators. In yet another vain attempt to create trouble for Morocco, the Algerian official substituted himself to the Polisario Front, which is claiming the independence of Western Sahara, and asked the UN Human Rights Council to endeavour to expand the MINURSO mandate to human rights monitoring. “Algeria encourages the UNHRC to follow up the implementation of the UN recommendations related to monitoring the situation of human rights in the Sahara”, he said Wednesday before the UNHRC 25th ordinary session held in Geneva March 3 to 28. Ramtane Lamamra nevertheless seems to have a short memory problem since he forgot that Morocco’s determination is so strong that even the U.S. State Department had failed to pass such a draft in the UN Security Council. He also seems to forget that Morocco, a founding member of the HRC, was re-elected last November for a second term (2014-2016) in recognition of its commitment to the consolidation of the rule of law, democratic governance and human rights. Besides, Morocco’s diplomacy, both official and parallel, is very active in Geneva to counter the new offensive launched by neighboring Algeria. 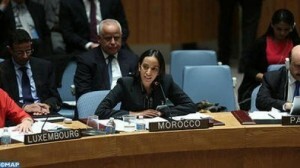 Moroccan diplomats are constantly on the alert to thwart the manoeuvres against Morocco’s territorial integrity and particularly those hatched by the Algerians and their protégé, the Polisario, that do not miss any opportunity to try to gain some support to their unconvincing separatist theses.